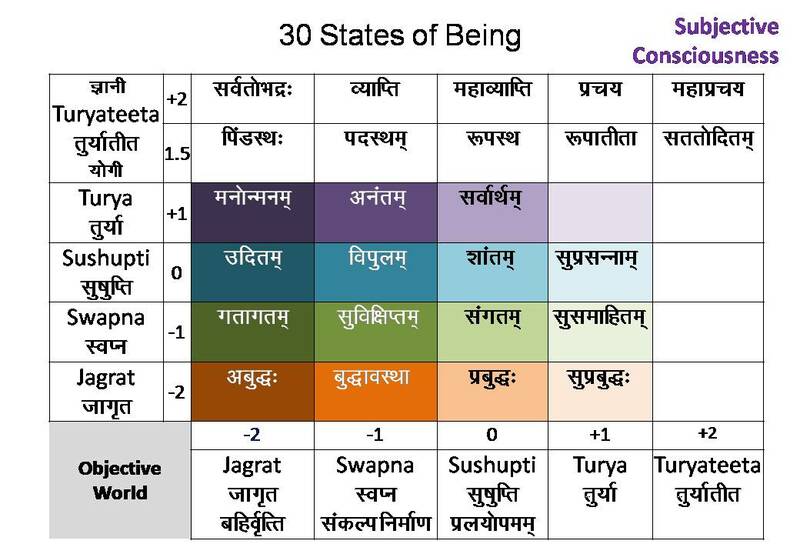 Sanskrit names of various states are very meaningful. One can not get this fragrance in English! This table also helps you to count these names and end the debate of the number of states! Basic states are five and fifteen variations (Given in colored table) makes it 20. 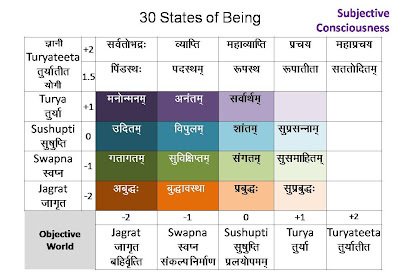 Object (Left bottom) and Subjective consciousness (Right top) are also considered, hence 22 States of Being. If we add to this the way Yogi perceives and the way Jnani perceives or experiences, ten more words get added, making the total 32. In this only one state which is not the experience of an Yogi is Satatoditam, because it is the guesswork of Yogi. So this is not the actual experienced state. For this reason, we must minus one from 32, that makes it 31. So, the number depends on how you count it! It is better to experience these states "first hand" through Sadhana! Once experienced, all doubts will disappear, with the help of the GRACE of LORD SHIVA!!!!! thanx Prem...now how do we ientify each state of being??? Dear Naveen, for identification of each state, we need to go more deeper into this subject. If interested you may see this link which gives total details of each of these states. Much Love, Prem.